Jimmy Butler protects the ball from Clippers guard Tyrone Wallace on Tuesday. 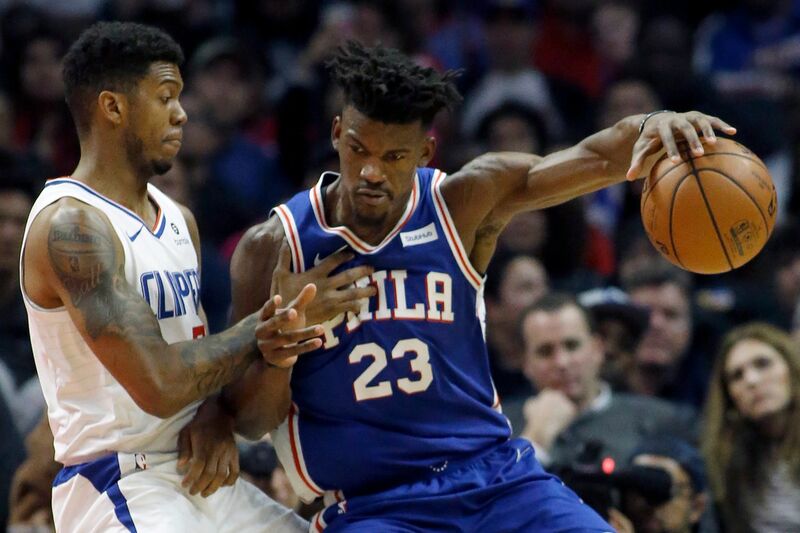 LOS ANGELES — The 76ers held off the Los Angeles Clippers, 119-113, at the Staples Center on Tuesday night. Here are my main takeaways and best and worst awards. The Sixers lose a lot when Jimmy Butler and Joel Embiid aren’t in games together. The Clippers went on a 13-2 run once Butler was ejected for being involved in a shoving match with Los Angeles guard Avery Bradley with 7 minutes, 1 second remaining. The Sixers had suffered their worst loss of the season, 129-95, on Sunday with Embiid sidelined with left knee soreness. They were able to hold on this time, though. Embiid and Ben Simmons need to coexist better and be more aware of their surroundings when rebounding. There have been times when the duo were more like opponents battling for a rebound instead of teammates. Even though Embiid was pushed a little, one play led to Embiid’s getting elbowed in the face by Simmons in the third quarter. One of them is going to get hurt if they don’t stop doing what appears to be fighting over rebounds. The Sixers need a Patrick Beverley clone. The Clippers' pesky reserve point guard plays with a nastiness and intimidating defensive presence. Philly desperately needs a perimeter player like him. The Sixers' defense would go up two or three notches if they had him to play alongside dominant defenders Embiid and Butler. Jonah Bolden deserves more minutes. The rookie power forward can extend offensive possessions with his rebounding. He can also create much-needed spacing with his three-point shooting. He finished with a career-high nine points on 4-for-4 shooting. He also grabbed a career-best five offensive rebounds, and had six boards total. Best performance: This goes to Embiid. He finished with game highs of 28 points, 19 rebounds, and 3 blocks to go with 5 turnovers. Fifteen of his points came in the first quarter. Worst performance: I couldn’t avoid giving this to Furkan Korkmaz. The Sixers' reserve swingman missed five of his six shots en route to finishing with three points. Best defensive performance: This goes to Embiid. Worst statistic: I gave this to the Sixers' 21 turnovers, with eight coming in the third quarter. Best statistic: This goes to the Sixers' scoring a season-high 76 points in the first half.